New words are created all the time; “leadercast” is something new – well relatively new. John C. Maxwell, had a vision in 2000 to create a different kind of leadership conference. One that was affordable and accessible to leaders from all kinds of backgrounds. 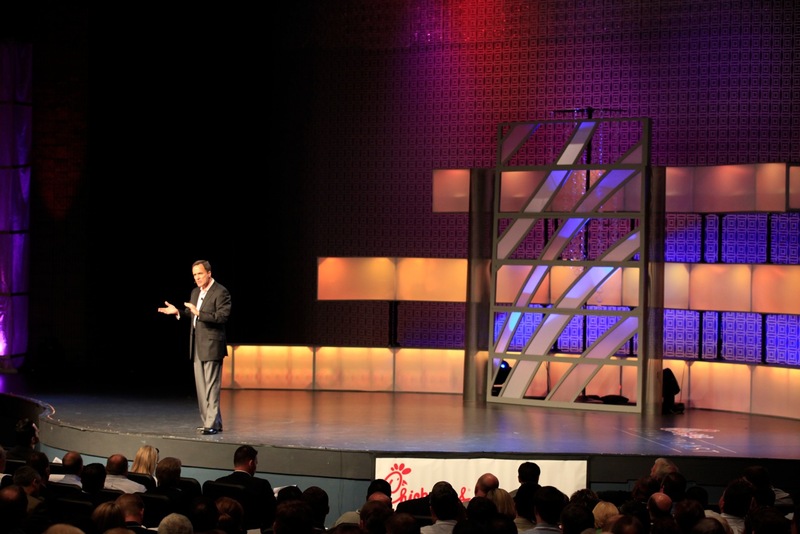 The new Maximum Impact Simulcast was born and GiANT Impact later began producing the event and teamed up with Chick-fil-A to bring this leadership conference to more leaders than ever before. Who is a leader? If you influence someone – you are a leader. You bloggers out there, you readers, you parents, teachers, and participants in life have an opportunity to lead. 1. What would my replacement do? We fall in love with and become comfortable with the way we do things and the way we make decisions. Couch illustration, bought for one house and years later you moved and moved the old couch to a new house and it is ugly there, but by now you have fallen in love with that couch and you have lost objectivity and love the couch even though the couch is ugly and everyone except you realizes it. When we get comfortable we lose our objectivity! We are so emotionally wrapped up in what we are doing that we will never be able to be successful at moving forward. 2. What would a great leader do? This question takes you out of your immediate situation, out of the smallness of your situation and elevates your perspective, expands your vision. Great leaders, selfless, not in it for me, and not concerned for my own reputation. 3. What story do I want to tell? Every decision you make is a part of the story you want to tell. When this is simply a story I tell, what story will you tell? This is the legacy you will leave. Don’t ever make a decision that will make you a liar for life? Remember you are a leader – so lead. This entry was posted in Coach's Blog, denny meyer, ICA, life coach, Sonrise Coach, Spiritual Coach - Denny Meyer, spiritual coaching and tagged coach denny meyer, Dennis Meyer, denny meyer, dennymeyer.com, spiritual coach, spiritual coaching, spiritual coaching services. Bookmark the permalink.